How to Make Fireworks: Spinning Saxons — Skylighter, Inc. It's the dead of winter. You want to make fireworks--"something," just to smell the smoke. Perhaps you'd like to entertain the party-goers with a pretty device. You'd like to light up the night as the crowd looks out into the cold through the picture window from the warmth inside the home. You want to work and play with something that allows you to be creative--something which offers pyro lessons, but does not require a lot of drying time, space, or time spent outside the pyro workshop. You don't want to make a lot of noise and irritate the neighbors. They might even enjoy something pretty if they happen to see it burning in the back yard. We have just the thing for you: saxons. You can learn a lot by working with saxons, and you can keep them as small and simple, or make them as large and complex as your heart desires. Back in the beginning of 2003, John Werner an article on making saxons. The articles was simple, two or three pages, text-only tutorials, which started with large, relatively complex models, and then explored some of the options for making these devices. I was inspired by John's explanations of the techniques involved in making saxons, so I played with them for awhile back then. This essay on saxons, which I've also divided into two projects, is just my way of expanding on those lessons with some photos, drawings and videos. But I never would have known how to begin with saxons if it hadn't been for John Werner sharing his experience with making them. Although saxons can be called fireworks wheels, their construction is extremely simple since the composition-filled tube also serves as the wheel frame, rotating on a simple axle. These simple vertically mounted fireworks wheels create lovely circular sprays of sparks in varying effects. Although not commonly seen in fireworks stores nowadays, saxons are traditional fireworks devices and domestic display fireworks manufacturers used to make and use saxons, often under the name "Merry-Go-Rounds." The simplest saxons use only a single paper tube, pivoting at its center point. This is the type of device, shown in the video above, that we will be building here in this first of the two projects. In the second project we will move on to more advanced models that use multiple tubes, joined by a short section of wood dowel, but still pivoting at the center. We will introduce additional fuel formulations to provide new spark effects. We'll also lead you through the construction of advanced configurations and larger devices, demonstrating additional construction methods. Using these you'll be able to create new and exciting effects, limited only by your own imagination. But for this first project, we'll start with 1/2-inch saxons to demonstrate the basic principles and processes of saxon construction. You can see in the sketch above that only one tube is used in the construction of this saxon. That tube has a hole drilled through its center so that it may be mounted on an axle for it to spin on. The fuel in both ends will burn toward the center of the saxon until all of the fuel has been exhausted. Note: These fireworks safety essays detail safety precautions for ball milling, mixing compositions, making fireworks, and storing finished compositions and devices. Please read and study those precautions before building your saxons. safely store compositions and devices. Let's make the fuel first, since it will have to dry before we use it. This batch size will provide enough fuel for approximately 10 of the saxons we will be building in this project. It is also perfect for use in this ball mill, and the complete batch should be milled for two hours. See this ball milling tutorial for complete instructions for ball milling. First, screen the potassium nitrate for the base mix through a 100-mesh screen. If some or all of it will not pass through the 100-mesh screen, use a blade-type electric coffee grinder to mill it down until it will pass through the screen. Warning: I never mill anything but individual chemicals in the coffee grinder. I use a separate coffee grinder only for oxidizers, and a different coffee mill for fuels. I thoroughly clean it after using it for each different chemical. Combine the three components of the base mix and screen them together through the 100-mesh screen at least twice to mix them thoroughly. The more thoroughly mixed the base mix is, the better saxon fuel it will make. After the base mix has been ball milled (or screen mixed), using rubber-gloved hands and a garden spray bottle, spray enough water into the composition so that it becomes dampened like brown sugar. It should form a ball when squeezed together, but the ball should crumble easily when poked with a finger. Grate the dampened composition through a 20-mesh screen, onto kraft-paper lined trays, forming layers of comp that are about 1/8-inch thick on the paper. Dry the granulated powder thoroughly and gently run the dry powder through the screen again to break up any large lumps in it. Granulating the powder this way makes it much easier and less messy to use when we start ramming it in saxons. Note: Spherical titanium is smooth and is safer to hand-ram than sponge titanium. Finer spherical titanium will produce a thick spray of smaller, shorter-lived sparks. Coarser spherical titanium will produce a more sparse spray of larger and longer-lasting sparks. To make a finished batch of fuel for this project, first ensure that the titanium will pass easily through a 40-mesh screen. Then simply add it to the base mix and shake the combined materials in a sealed container to mix thoroughly. Note: This is the simplest way to make the saxon fuel--by mixing the effect additive with the granulated base mix. However, the heavier titanium particles tend to settle out of the less-dense base mix over time and with handling. So, be sure and keep the fuel homogeneously mixed as you remove scoops of fuel during the ramming operation described below. In between saxons, re-shake the fuel to ensure the consistent dispersal of the effect additive. First, on one end of the 1/2-inch-ID x 5-inch-long tube, put marks at 0, 90, 180, and 270 degrees as shown in the photo below. Just eyeballing the locations of these marks will be close enough. Now, extend the alignment marks down onto the sides of the tube. Referring to the two photos above, when we're done, the axle of the saxon will pass through the tube from the line at the "0" mark, which we'll call the "back" of the device, to the line marked "180," on the "front" of the device. One of the two vent holes will be near the top of the tube (as viewed in the first photo) along the line marked "90." The other vent hole will be near the bottom of the tube (as viewed in the first photo) along the line marked "270." Referring to the cross-sectional sketch of the saxon, you can see that the axle hole will pass straight through the center of the tube, front to back, perforating both sides of the tube. The vent holes will be drilled near the ends of the tube and on opposite sides of the tube, each perforating only one side of the tube. To mark the locations where the axle hole will be drilled, measure 2-1/2 inches in from the end of the tube, and put marks at this point on two of the lines on opposite sides of the tube from each other ("0" and "180"). These marks will be on the "back" and "front" of the saxon at the midpoint of the lines. On one of the other lines ("90"), measure in 5/8 inch from the top end of the tube and make a mark. 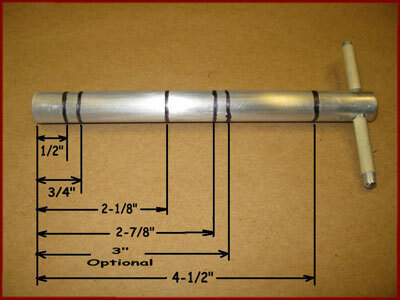 On the remaining unmarked line ("270"), measure in 5/8 inch from the other end of the tube and make a similar mark. These are the locations where the vent-holes will be drilled. You should now have two marks opposite one another on the "front" and "back" of the tube, half-way along the tube's length. You should also have two more marks, one on each "side" of the tube, near the opposite ends of the tube. Use a sharp awl to poke indentations at these four marked locations. The indentations will make it easy to center the drill bit when drilling the holes. 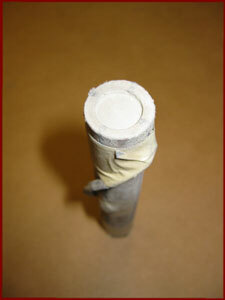 Insert a 1/2-inch wood dowel into the tube to back up the inside of the paper tube as the holes are drilled. This will prevent the inner layers of paper from being pushed inward as the holes are drilled in the tube. Use a piece of dowel you don't care about for this purpose, as it will be damaged by the drill as it penetrates the tube. Drill 5/32-inch holes at all four hole locations. Then enlarge (just) the midpoint axle holes with the 9/32-inch drill bit. Stop drilling when the drill bit has completely drilled through the side of the paper tube, and is just starting to drill into the wood dowel. Note: Starting those axle holes with the smaller drill bit, and then enlarging them with the larger one is easier than just using the larger bit. After removing the wood dowel, strengthen the vent holes, by dripping some super-glue onto them. 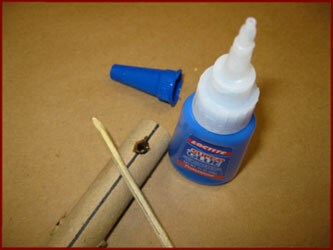 Spread the glue around thoroughly inside the hole with the tip of a bamboo skewer or toothpick so it soaks into the paper tube. This will help to prevent the holes from enlarging as the saxon burns, which would decrease thrust. Note: Use the super-glue in a well ventilated area, as the fumes from it can be irritating to breathe. Allow the glue to dry for 5-10 minutes before proceeding to the next steps. 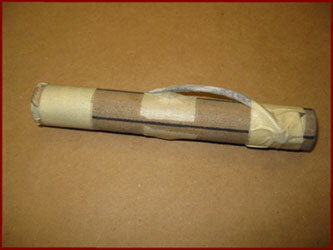 Use 1-inch-square pieces of masking tape to temporarily block one end of the tube, and all four drilled holes. 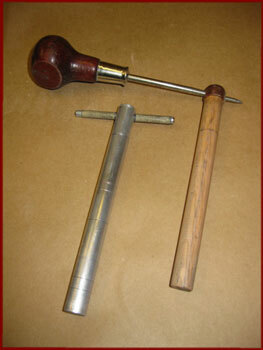 One simple flat-ended rammer is required for making saxons. If only a few saxons are to be made, this rammer can be a 6-1/2-inch-long section of a simple 1/2-inch hardwood dowel. If a more durable rammer with a longer life is desired, a section of an aluminum rod can be used. Oak hardwood dowels and aluminum rods are commonly available at local hardware and home improvement stores. A 3/8-inch copper plumbing pipe-cap will fit snugly on the end of a 1/2-inch wood dowel, and will prevent that end from mushrooming and/or splitting as it is struck with the mallet. No matter which material you use for your rammer, it's a good idea to cross-drill the top end of it so that a T-handle or awl can be inserted through the rammer. This T-handle can then be used to twist the rammer free and to more easily remove it from a tube after ramming an increment of clay or fuel. It is very helpful to have index (alignment) marks on the rammer to indicate when clay and fuel segments have been rammed to the desired height in the tube. These marks will help you to know when to stop ramming clay or fuel and contribute to accuracy and consistency in construction. I will refer to these marks in the detailed ramming instructions below. The correct location for the index marks on the rammer for these saxons can be seen in the photo below. The "bottom" of the rammer is to the left and the "top" of the rammer is to the right, with the "T" handle installed. The marks are made using a Sharpie pen. Note: The Sharpie marks will not wear off a wood rammer very easily. But they will quickly wear off the aluminum rammer. So it is a good idea to use a thin file to permanently mark that rammer. Then those filed marks may be darkened with a Sharpie marker. As the ink penetrates the grooves, the marks will show up better and last longer. First, measure 4-1/2-inches up from the bottom of the rammer and make the first index mark as shown above. This index mark will be even with the top of the saxon tube when the first clay plug has been rammed to the correct height. This can be seen in the photo below which shows the saxon tube aligned with the saxon diagram. The rammer is positioned as would be inside the tube after the first (bottom) clay plug (far left in diagram) has been rammed to the correct height. Note that the first index mark is even with the top of the tube as desired. Next measure 3-inches up from the bottom of the rammer and make the second index mark. This mark will not be used in the current project, but will be used for a variation of the saxon we will discuss in the next project. Now measure 2-7/8-inches up from the bottom of the rammer and make the third mark. This mark will be even with the top of the saxon tube when the first fuel grain has been completed to the proper height. Next measure 2-1/8-inches up from the bottom of the rammer and make the fourth mark. This mark will be even with the top of the saxon tube when the central clay plug has been rammed to the correct height. Now measure 3/4-inch up from the bottom of the rammer and make the fifth mark. This mark will be even with the top of the saxon tube when all but one increment of the second fuel grain has been rammed to the correct depth and it is time to install the ignition fuse. Finally, measure 1/2-inch up from the bottom of the rammer and make the sixth mark. This mark will be even with the top of the saxon tube when the second fuel grain has been completely rammed to the correct height. Ok, the tube has been drilled, and the super-glue reinforcing applied to the vent holes is dry. The masking tape is closing off the drilled holes and one end of the tube. Our rammer is ready and it is now time to start ramming clay and fuel in the saxon tube. A solid ramming post and a block of hardwood or aluminum to ram on, as well as a non-bouncing mallet like a rawhide mallet, are all required for consistent, solid hand-ramming. 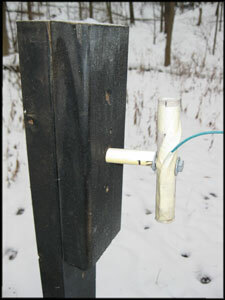 Place the block of hardwood or aluminum on the ramming post and position the tube upright on it. Carefully introduce 3 grams of bentonite clay into the tube through a funnel. Hold the tube steady in order to prevent clay from escaping from the bottom of it. Put the rammer into the tube, twisting it as you go to reduce "fluffing out" of the clay, and press the clay down as much as possible with hand pressure. Slide the rammer out an inch or two, and repeat that process to get as much clay as possible consolidated under the rammer. Now, with 8-12 good solid mallet blows, solidly compact the clay plug. The tube may start to very slightly bulge in the area where the clay is being compacted. If the right amount of clay was used, the first rammer alignment mark should now be even with the top of the tube, meaning the clay plug is 1/2-inch thick. If the amount of clay needs to be adjusted up or down to get that mark alignment correct, make a note of that and adjust accordingly with the next saxon. If a little more clay needs to be rammed to bring the mark up to the desired location, go ahead and do so now. Remove the rammer from the tube, and tap any excess clay back into its tub. Remove the masking tape covering the vent hole that is now right above the top of the clay plug that was just rammed. Use a 1/8-inch drill bit to clean out any excess clay that has gotten into that hole. The hole should be right above the top of the clay plug. Insert the end of a 5-1/2-inch-long piece of fast-fuse into that vent hole until it is about 1/2-inch into the hole. 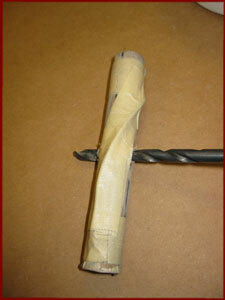 Secure the fuse in place with a 6-inch piece of masking tape double wrapped around the tube. Completely tape-seal the area around where the fuse enters the tube. Next, fuel is to be rammed in the tube to create the first fuel grain. Each increment of fuel should be a level 1/4-teaspoonful, weighing about 1.3 grams. After each fuel increment has been rammed, it should increase the fuel grain height by about 1/4 inch. Whereas ramming the clay plug required 8-12 good, solid mallet whacks, each fuel increment only requires 4-6 medium mallet blows. This should be sufficient to consolidate it and make it begin to feel good and solid under the rammer. Ram increments of fuel, one at a time, until the fuel level brings the third rammer alignment mark up even with the top of the tube. You can see that the fuel has now been rammed up to the top of that fuel section. Note: We're skipping the second (optional) rammer mark for now with this model saxon. We will be using it in the next project. It's now time to ram the central clay plug in the tube. This plug will be 3/4-inch tall when it is rammed, and requires 4.5 grams of bentonite clay. Introduce the clay into the tube, tamp it down with the rammer, and ram it with 8-12 solid mallet blows. That should result in the fourth rammer mark appearing in alignment with the top of the tube. Ram more increments of fuel, now, as before, until the fifth alignment mark is even with the top of the tube. Looking down into the tube, you can see that the fuel has now been rammed up even with the bottom of the second vent hole. Remove the masking tape covering the second vent hole. The loose end of the fast-fuse is now bent and inserted about 1/2-inch into the second vent hole. Using a 6-inch-long piece of masking tape, double wrap the tube completely covering that vent hole, to securely sealing the area where the fuse enters the tube. Now ram one more increment of fuel bringing the rammer up to the sixth alignment mark, which will leave 1/2-inch of the end of the tube empty. Push the empty end of the tube into the tub of clay. Fill the empty end completely with clay by shoving loose clay into the end with your fingers. Ram that clay solidly with 8-12 blows of the mallet. Fill any remaining void with more clay, and ram it again, bringing the clay up to the top of the tube. Now we want to create a hole in the middle clay plug, connecting the two 9/32-inch holes which were drilled in the tube. Remove the tape over those holes. 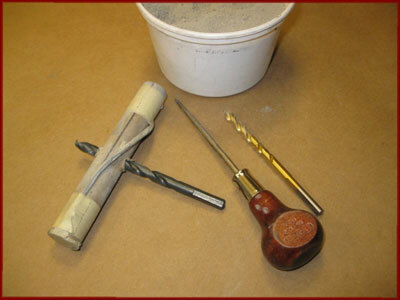 Use an awl to gently scratch out the clay in the tube openings. Let the loose clay fall back into the tub of clay. 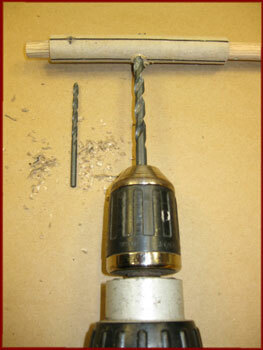 Then using a 1/4-inch drill bit, twist it by hand through one of the 9/32-inch holes and into the clay plug. Drill a hole through the clay between the two holes. It can ease this process to drill in from both tube holes until the hole meets in the middle of the clay plug. Then use the 9/32-inch drill bit to ream out, clean and smooth the hole in the clay. Warning: Hand-twist-drill this hole. Do not use a power drill around live fuse or composition. Drills can emit sparks during their use. Next, use pieces of masking tape to create a double-layer of tape covering over the fast-fuse which is connecting the two vent holes, as shown in the photo below. Using an awl, poke a hole in the masking tape fuse-cover next to the fast-fuse and insert a 4-inch piece of visco ignition fuse alongside and tightly against the fast fuse. 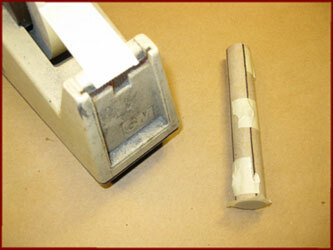 Secure the visco fuse in place with a short piece of masking tape. The hardware to erect the saxon on its stand consists of a 4-inch-long 1/4-inch lag bolt, two 1/4-inch washers, and a short section of tube such as 1/2-inch plastic pipe or paper tube. A washer is put on each side of the saxon, with the bolt going through the saxon and the washers. Next the pipe is put over the bolt and the bolt is then screwed into the wood support stand. The bolt should be tightened as far as possible while still allowing the saxon to spin freely. This saxon has been erected in a way that it will spin counter-clockwise during its display. If it had been flipped the other way as the bolt was installed through it, it would spin clockwise as it displayed. This particular saxon is the one demonstrated in the video at the beginning of this project. It is made with Titanium Spark fuel, and both vents are ignited simultaneously by the common fast-fuse, which is ignited at its middle by the visco ignition fuse. It displays for about 5 seconds. So now light that sucker and see how yours works! Now that we have the basic saxon construction techniques down, let me give you a preview of the second project in this series. In it we will explore some more-advanced, more-complex, and longer-lasting versions of these wheels. Here is a little taste of what you can expect to find there. Three more fuel formulations, all using the same base mix as presented in this project, but with different additives to create different effects. New effects include Charcoal (orange/gold) Spark, Gold Glitter and Silver Glitter. How to create saxons with a longer duration burn time. How to create saxons which reverse direction of rotation during their performance. How to create saxons which change spark effect multiple times during their performance. Creative combinations of these effects. How to build larger saxons. Here is a video of a saxon which combines some of these new effects. When you've finished the second project, you'll have a tool kit of saxon formulas, techniques and configurations which will permit you to create amazing displays limited only by your own imagination.